This article is intended for systems administrators who use Group Policy/Group Policy Preferences to manage computers in a domain environment. Among the many challenges faced by Windows desktop engineers, configuring Internet Explorer in a corporate environment to provide a good balance of security and convenience stands out as particularly difficult to get right. I cannot think of any other piece of software that has required more of my time and effort to tailor to our needs than IE. Nor can I think of another application that generates as many non-error-related calls to our help desk. My project this week has been to develop a process for allowing approved ActiveX controls (ie., vetted controls used by business-purpose sites) to be silently installed and enabled by end users without granting sites more rights than needed. While working on this project, I found that there is a good deal of interplay among multiple Group Policy settings that, once configured, permit standard users to download, install, and enable ActiveX controls so that web sites “just work”. This blog post should help you configure those settings in three steps. The first order of business is to allow a standard user to download the ActiveX control files from sites in the Internet Zone. This can be done by configuring the “Download signed ActiveX controls” and the “Download unsigned ActiveX controls” Group Policy settings in Computer Configuration/Policies/Administrative Templates/Windows Components/Internet Explorer/Internet Control Panel/Security Page/Internet Zone. My understanding is that signed code from trusted publishers is always downloaded silently if the “Download signed ActiveX controls” setting is Enabled and the drop down menu item is set to Enable or Prompt. (It’s not clear to me why signed add-ons from trusted publishers wouldn’t be separately configurable here.) I have set “Download signed ActiveX controls” to Enable, and “Download unsigned ActiveX controls” to Prompt, although the more secure setting would be to Disable downloading unsigned controls. The next order of business is to allow a standard user to install ActiveX controls for specific sites. 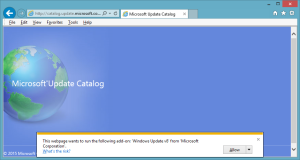 This can be done by configuring the “Approved Installation Sites for ActiveX controls” setting in Computer Configuration/Policies/Administrative Templates/Windows Components/ActiveX Installer Service. For each web site, enter the full domain name of the site where the ActiveX control is hosted (wildcards are not allowed) and provide a series of values governing the installation of trusted and signed, signed, and unsigned files, along with exceptions to HTTPS certificate errors. The default series of values is “2,1,0,0”, and I’ll expand on this later in the post. You may need to relax these settings for individual sites depending on whether the control is signed or if the site has HTTPS errors. Enter a detailed comment explaining the rationale for configuring the item (who configured it, when and why), so that you or another administrator can periodically revisit the list and evaluate whether the entries are still necessary and whether the settings are still correct. A decent amount of thought needs to be given to the significance of the values, which are described more fully at Implementing and Administering the ActiveX Installer Service. The first three numbers in the default setting of “2,1,0,0” will (1) allow an ActiveX control that is signed by a certificate in the Machine or Enterprise Trusted Publishers store to be installed silently, (2) prompt the user before installing an ActiveX control that is signed by a certificate that is not in the Trusted Publisher Store, (3) and not install an unsigned ActiveX control. For example, if we wish to allow the “Microsoft Update Catalog” ActiveX control to be silently installed when a user visits http://catalog.update.microsoft.com/v7/site/Install.aspx, we can add the domain name “http://catalog.update.microsoft.com” to the list and give it the values “2,1,0,0”. Because this ActiveX control is signed by a certificate in the Machine or Enterprise Trusted Publishers store, the first value “2” allows the silent installation. If the user encounters an ActiveX control that can be downloaded but is not permitted to be installed silently, the user will receive a Security Warning pop-up window from the ActiveX Installer Service similar to the screen capture below. In this case, the user encountered a signed ActiveX control that was not signed by a certificate in the Machine or Enterprise Trusted Publishers store. If we want to suppress this prompt so that the control will be installed silently, we would need to change the second number in the series to “2”, as so: “2,2,0,0”. As conscientious system engineers concerned about removing distractions for our users, we may wish to suppress the “This webpage wants to run the following add-on: ‘<add-on name>’ from ‘<company name>’.” warning/alert that appears in Internet Explorer when a user visits a site that loads an ActiveX control that has been downloaded and installed, but for which the ActiveX control is not yet enabled for the user. To silently enable a specific ActiveX control for a specific domain for the current user, we can use Group Policy Preferences to create a registry value under HKCU with the Class ID (CLSID) of the add-on and the domain name where it is allowed to run. Be sure to enter a detailed comment explaining the rationale for configuring the item. The Class ID can be found via the Manage Add-ons dialog box (which means that the add-on will at least need to be downloaded). That’s all there is to it. When a user encounters a site that requires an approved ActiveX control, the control will be downloaded, installed, and enabled in the background. How can I enable an add-on and prevent users from disabling it? The Group Policy setting “Add-on List”, available in both the User Configuration and Computer Configuration, accepts a CLSID and a numerical value indicating how the add-on should be handled. A 0 (zero) indicates that the add-on should be disabled and users should be prevented from enabling it. A 1 (one) indicates that the add-on should be enabled and users should be prevented from disabling it. A 2 (two) indicates that the add-on should be enabled and users should be permitted to enable and disable the add-on through the Manage Add-ons dialog box. However, in my experience, configuring an add-on with a value of 2 does not automatically enable the add-on for users, and they will see the yellow bar asking them if they want to enable or disable it when they open IE. I can’t quite see the use case for the value of 2. How do I get more information about an add-on? How do I get information about the ActiveX control file itself? The binary file itself will be referenced in the HTML of the page that requires or installs the control. My preferred method of finding the binary is to use the DOM Explorer in IE’s F12 Developer Tools to view the rendered HTML of the page where the control is installed, and the search for the string “codebase”. Entering that URL in a browser will allow you to download the file and look at it. In the case of a digitally signed file, viewing the Properties of the file will reveal a Digital Signatures tab with more details about the signer and the certificate. An ActiveX control can be a .cab, a .dll, or a .ocx file. So why don’t I need to enable the Adobe Flash ActiveX control in this way? As an alternative to the GPP HKCU registry method of approving ActiveX controls described above, an administrator could create a Class ID subkey under the PreApproved registry key to pre-approve the ActiveX control for all users of the computer on all web sites. Setting such a subkey still permits the user to Disable and Enable the add-on through the Manage Add-ons dialog box. It is also possible to use the Trusted Sites zone as the mechanism for controlling installation policy for ActiveX controls. This can be done by configuring the “Establish ActiveX installation policy for sites in Trusted zones” setting in Computer Configuration/Policies/Administrative Templates/Windows Components/ActiveX Installer Service. The same options for trusted/signed, signed, and unsigned controls as well as exceptions for HTTPS errors exist in this setting, but they apply to any site in the Trusted Sites zone. 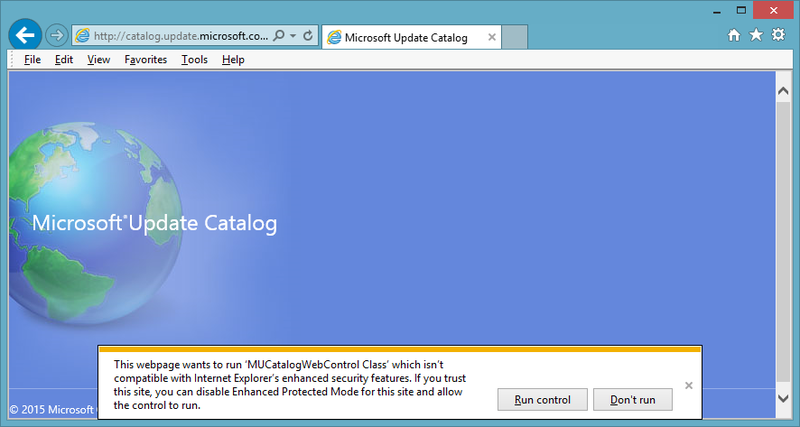 Consider this carefully – once this setting is enabled and configured, any site in the Trusted Sites zone will be allowed to silently install ActiveX controls, even those sites that you may not wish to do so, and exceptions for signed/unsigned controls and HTTPS errors will be applied to all sites. This setting therefore offers far less granularity than configuring each site individually using the “Approved Installation Sites for ActiveX controls” setting described above. 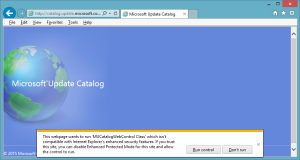 You may need to disable unwanted ActiveX controls installed from these sites via GP by Class ID. Sites can be added to the Trusted Sites zone via the “Site to Zone Assignment List” setting in User Configuration/Policies/Windows Components/Internet Explorer/Internet Control Panel/Security Page. The Deployment Guy’s Enterprise Management of ActiveX Controls using ActiveX Installer Service blog post on TechNet describes some recommendations, including to install ActiveX controls only from reputable organizations, deploy commonly used ActiveX controls through your organization’s software deployment system rather than allowing controls to be installed automatically via the ActiveX Installer Service, and using only HTTPS hosted controls. These are excellent suggestions, but it’s not likely that your organization can follow all of these recommendations all of the time. If ActiveX Filtering is enabled, IE prevents ActiveX controls from running on all web sites, except for those sites that have been added to the per-site exception list by the user. In IE11, if ActiveX filtering is enabled, a blue circle with a slash through it will appear on the right-hand side of the address bar. See the MSDN blog post ActiveX Filtering for Consumers for an explanation of ActiveX Filtering. If Enhanced Protected Mode is enabled, add-ons must be compatible with Enhanced Protected Mode in order to run without user intervention. The Data for the values is a bit confusing, but the blog post How Internet Explorer Enhanced Protected Mode (EPM) is enabled under different configurations begins to explain the settings. I recommend reading the MSDN blog post Understanding Enhanced Protected Mode, which is a pretty technical explanation of the subject, noting the differences in its implementation between Windows 7 and Windows 8. Internet Explorer 8 through 11 includes a feature called out-of-date ActiveX control blocking, which is another candidate for configuration through Group Policy. If left unconfigured, scary looking security warnings may be displayed to users stating that certain controls are out of date.